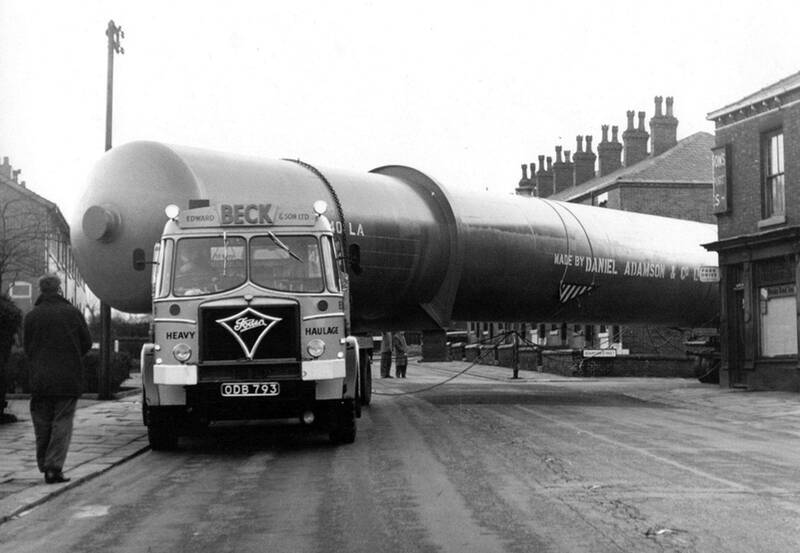 In December 1962 Edward Beck & Son undertook a job on behalf of Daniel Adamson & Co Ltd which involved transporting one of the biggest loads ever to cross the Pennines at that time. 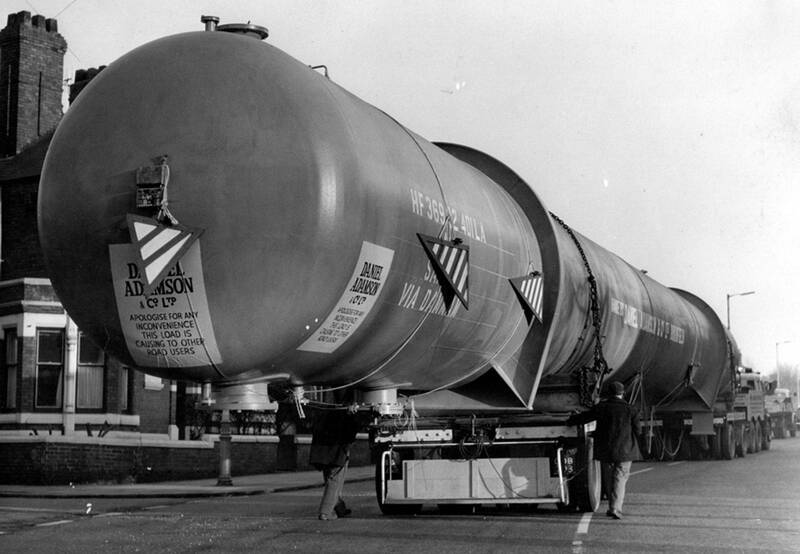 Destined for the Arabian-American oil refinery in Saudi Arabia the 121 foot long welded steel pressure column would take four days to arrived at Middlesbrough docks. In 1962 there was no M62 over the Pennines so the route taken was carefully planned using 'A' roads which passed through places such as Ashton-under-Lyne, Saddleworth, Huddersfield, Leeds etc on a journey which took four days. The movement was well documented at the time and i would imagine somewhere out there is quite a number of other images taken during that long journey. 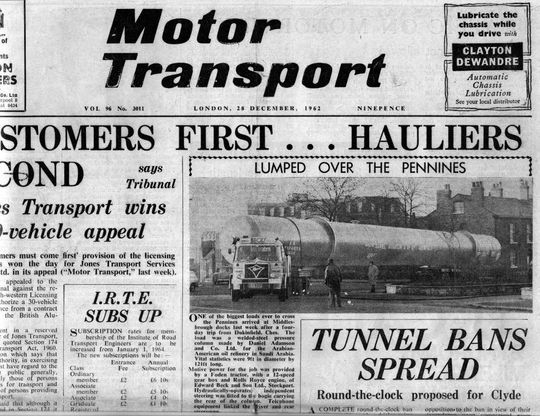 The movement of the long load made front page news in the 28th of December 1962 edition of Motor Transport. 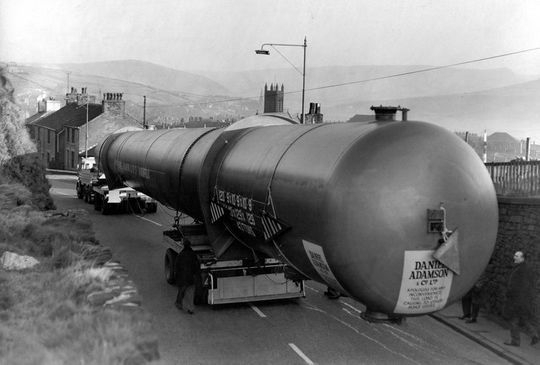 After collecting the load at the premises of Daniel Adamson & Co Ltd in December 1962, the 'Big Bopper' negotiates a left turn out of Adamson Street and heads West on to Dewsnap Lane in Dukinfield. 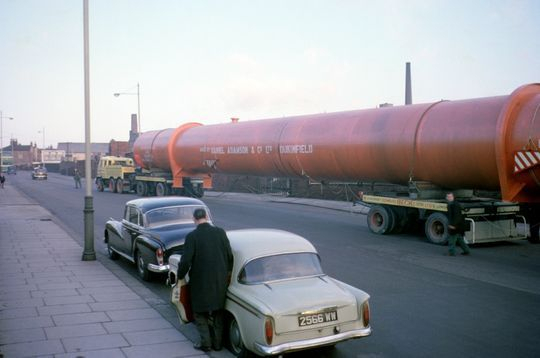 Another shot of the 'Big Bopper' as it negotiates the left turn out of Adamson Street on to Dewsnap Lane in Dukinfield. Today this particular location has not changed that much although the corner shop is now a house with the nearby former premises of Daniel Adamson & Co Ltd now a large private housing estate. 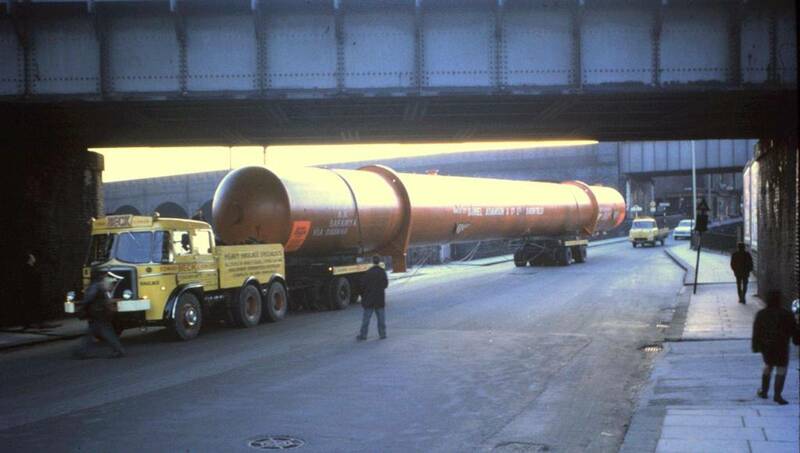 Pictured here heading down the A627 towards Dukinfield the 121 foot load was guided at the rear by rear steers men who were in contact with the driver by wired telephone equipment. 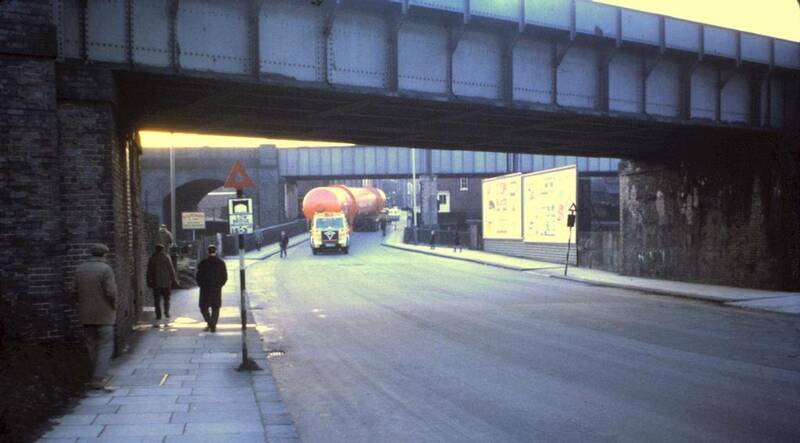 Hauled by the 'Big Bopper' the load makes it's way through Dukinfield. Fred Cutmore, manager of the machinery handling side at Beck's, is pictured getting into the car. Like all images in this gallery it is best viewed full size by clicking on the picture. After passing through Dukinfield the load is pictured here as it heads down the A627 Cavendish Street in Ashton under Lyne. With a Ford Thames 400E 15 cwt service van in support at the rear of the load, the 'Big Bopper' continues it's journey along the A627 Cavendish Street in Ashton under Lyne. As the load heads out towards Mossley in Tameside this wide angle view puts the overhaul length of the load into perspective, click on image to view it full screen. After collecting this 121 foot long welded steel pressure column from the Daniel Adamson & Co Ltd factory in Dukinfield the load slowly makes its way down the A670 Stamford Street into the town of Mossley in Tameside. Destined for Middlesbrough docks, a journey which took four days to complete in the days before the building of the M62, this was one of the biggest loads ever to cross the Pennines at that time.